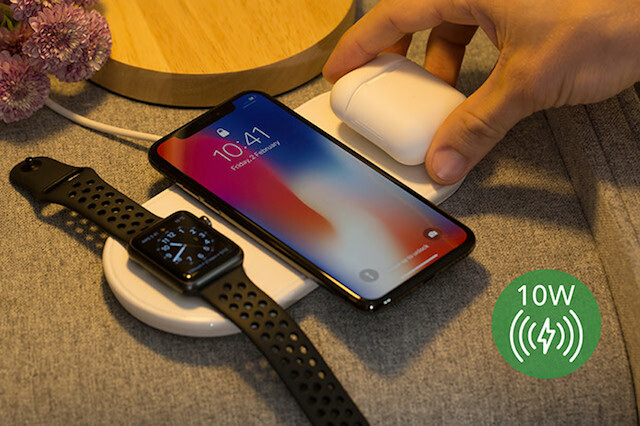 When Apple launched the iPhone X, the company made a big deal about its wireless charging technology and showcased an Apple-made wireless charging mat called AirPower which could charge the iPhone X, AirPods, and Apple Watch at the same time. However, almost six months have passed since the announcement and there’s no sign of it yet. But there’s still hope for those who loved the idea of AirPower but want it now. A new IndieGogo campaign by Plux for its Plux Wireless Charging Mat promises to do the same thing as Apple AirPower. The Plux Wireless Charging Mat looks eerily similar to Apple’s AirPower but it is a little thicker. However, that extra thickness comes with extra features. Firstly, the Plux Wireless Charging Mat is a fast wireless charger which supports fast wireless charging with up to 10W of power delivery. It also comes with built-in overheating and overcharging prevention. However, my favorite feature of this charger is that it comes with a detachable stand which can be attached in seconds to convert the Plux from a mat to a wireless charging stand. The Plux Wireless Charging Pad comes in two colors (black and white) has an MRP of $89, however, if you pre-order right now you can get it for a low price of $44. Do remember that since this is a crowdfunded product, you could face some problems down the road, such as the product not being complete in time, or the company not being able to deliver it at all. Plux has raised $114,492, which is 200 times more than its initial goal so the chances of product reaching the delivery stage are really high.